I’d been sitting with Anneena for an hour discussing everything from Frozen to the dangers of hiking drunk. She also told me she hopes to be a pediatrician when she grows up, but not a politician as they have a tendency to get shot. The whole conversation was in English (including the word pediatrician) and at times it was easy to forget that Anneena is just 10 years old. I could have spoken to her for hours more. 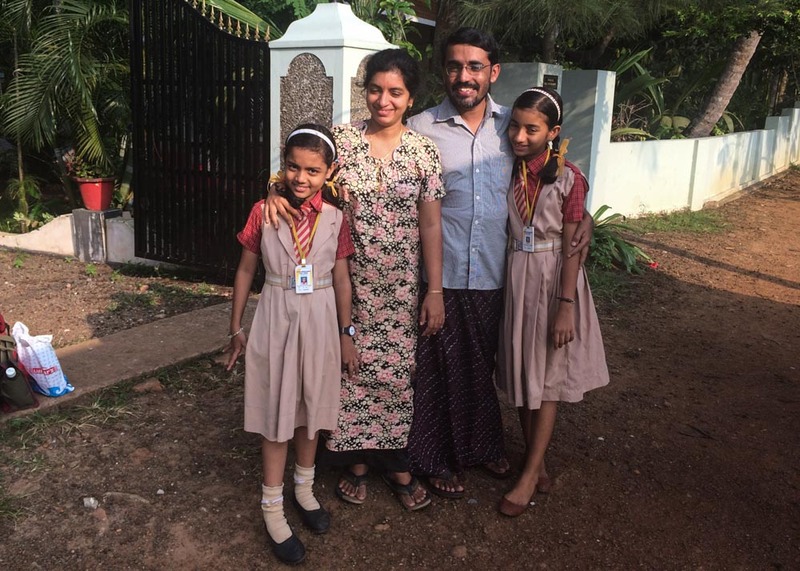 And her sister, mother, father, grandmother, aunt and cousins – the whole family are wonderful and spending time with them at Greenpalm Homes was one of the highlights of our time in Kerala. 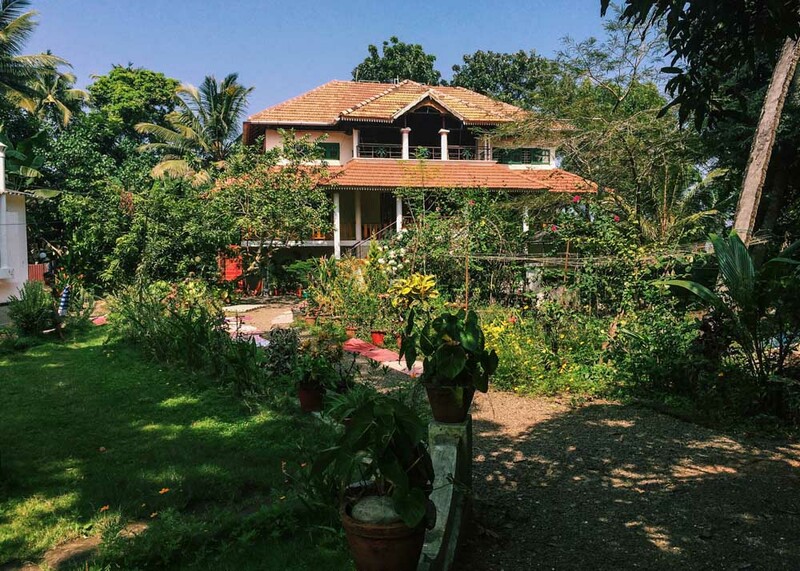 Greenpalms Homestay was started by accident by Anna, Annena’s grandmother. 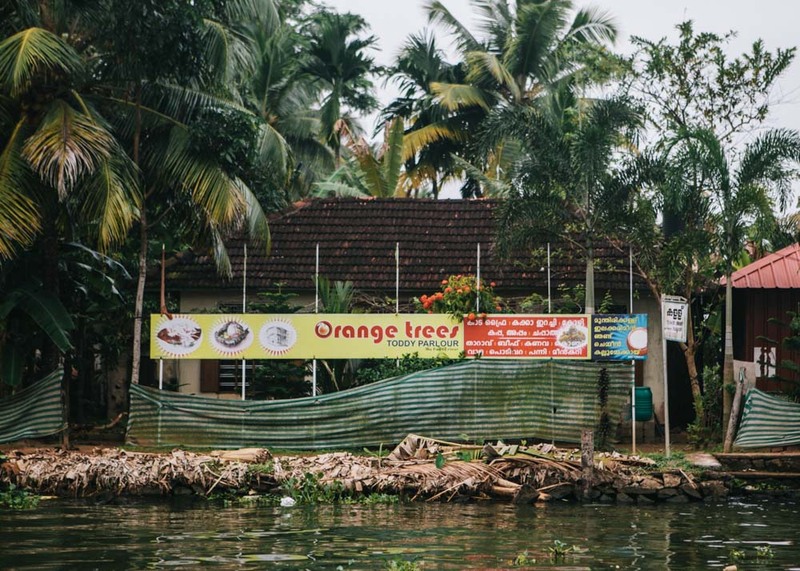 It was back in the day when Kerala’s backwaters weren’t quite the tourist thoroughfare they are today and only one hotel existed in the surrounding villages. Some Swedish tourists had gone to stay there, only to find it double-booked. Far from the nearby town, they sought shelter in the surrounding homes and Anna’s door was one of the ones they knocked. 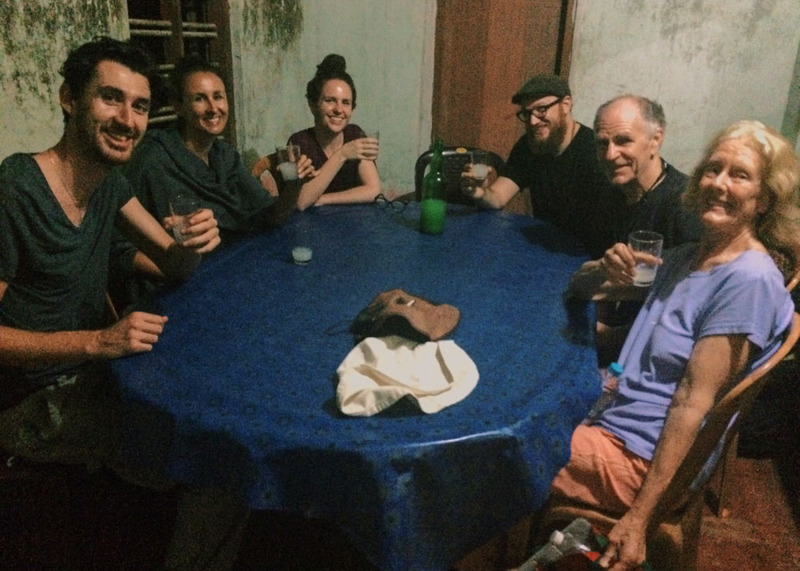 She proved an excellent host and stories of her hospitality spread until she found herself with a popular homestay. As the years passed, her son, Thomas and daughter, Maria came on board adding their homes to the mix. All are in the same lush compound and combined they have a range of rooms from the basic to the air-con. Delicious food is provided by Maria, and Thomas takes the lead in arranging trips around the village. You can go for walks, bike rides, canoe trips and more, or simply enjoy some time relaxing with the family. We went for two nights after having read about it on Never Ending Voyage, but it’s also featured in the Lonely Planet. Greenpalm Homestay isn’t a secret but it somehow still feels that way. Some people choose the homestay as an alternative to a houseboat and it’s a much more environmentally-friendly choice. Talking to Thomas, we heard stories of how polluted the village’s waters have become with the rapid increase of houseboat tourism, especially from energy guzzling boats. It made us seriously reconsider taking a houseboat trip, but our hearts had been set upon it so we still went for a two-night cruise. The two experiences were completely different ¬– the houseboat offers the luxury of watching the world go by from your boat whereas the homestay was a cultural immersion, allowing a full experience village life. From Greenpalm Homes, you can also take a canoe / small boat trip which takes you deeper into the waterways along quiet canalways that the houseboats are too big to explore. Both experiences are special in their own way, but if I had to make a choice, I think I’d choose the homestay. 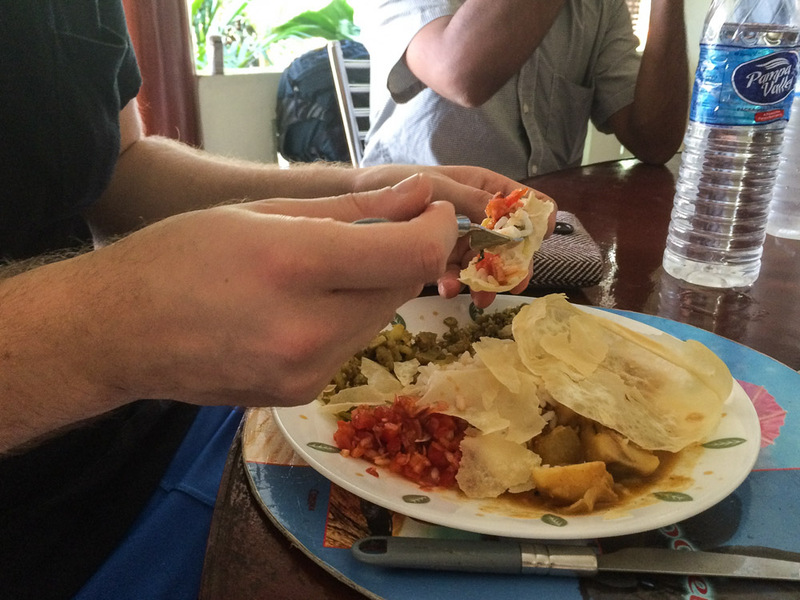 These are some photos from our time at Greenpalm Homestay. I whole-heartedly recommend it if you’re in Kerala. It was by far one of our highlights. We stayed in Thomas’s house, pictured above. There are two more houses in the compound (Thomas’s mother’s and his sister’s). 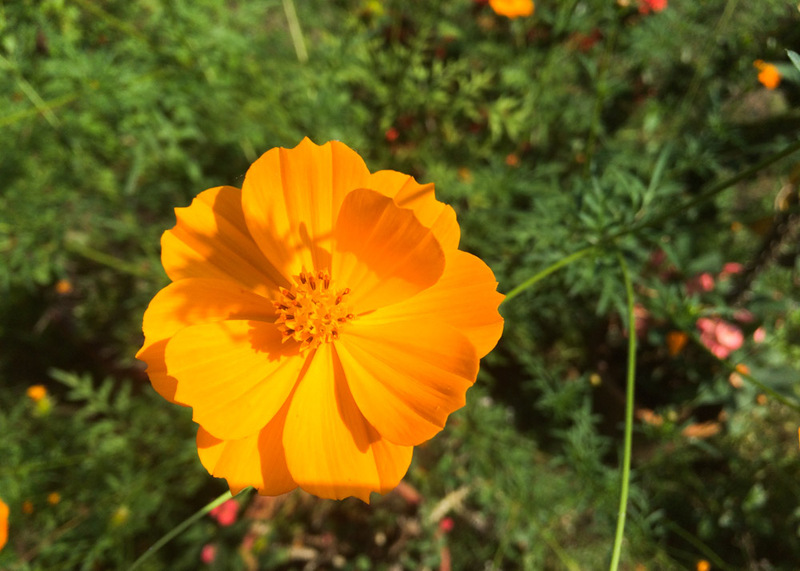 The garden is filled with gorgeous flowers and fruits, many of which are used in Anna’s wonderful cooking. Meal times are shared with the other guests and sometimes the family too. Daily chai is also served in the afternoon and is a good time to meet with other people. One morning we went for a walk with Thomas around the local villages. He stopped to tell us about different plants, introdce us to his friends and tell us stories of village life. At the end of our walk, we had a traditional breakfast at one of the villager’s homes. 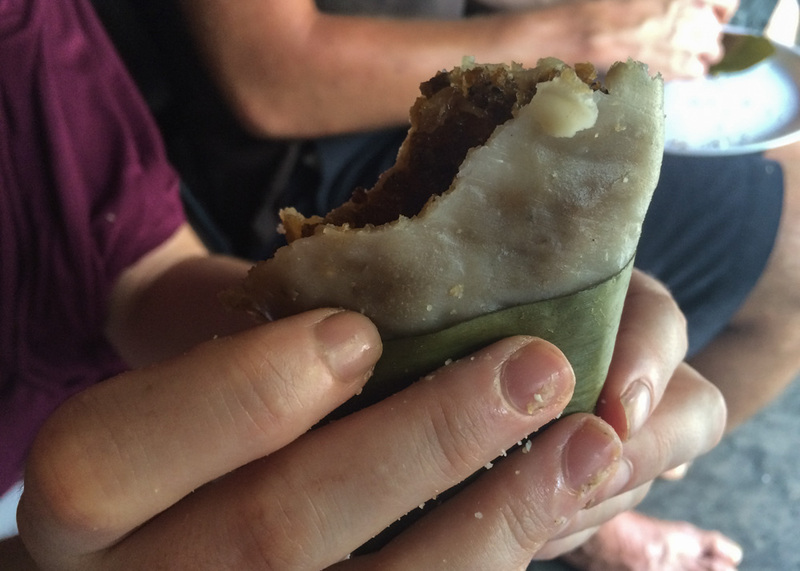 … followed by a delcious sweet treat of pancakes filled with a sticky coconut filling. We also took a gorgeous boat trip through the canals that the big houseboats can’t fit through. This is where we saw stunning scenes such as these mirrored palm trees. 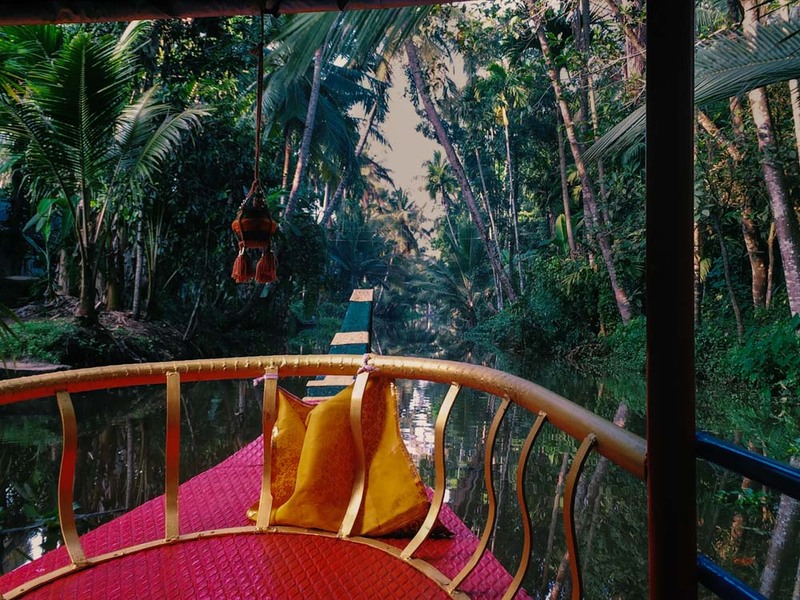 You don’t see anything like this from the houseboats, making Green Palms worth the trip alone. We stayed on the boat trip until the sun started to fall. 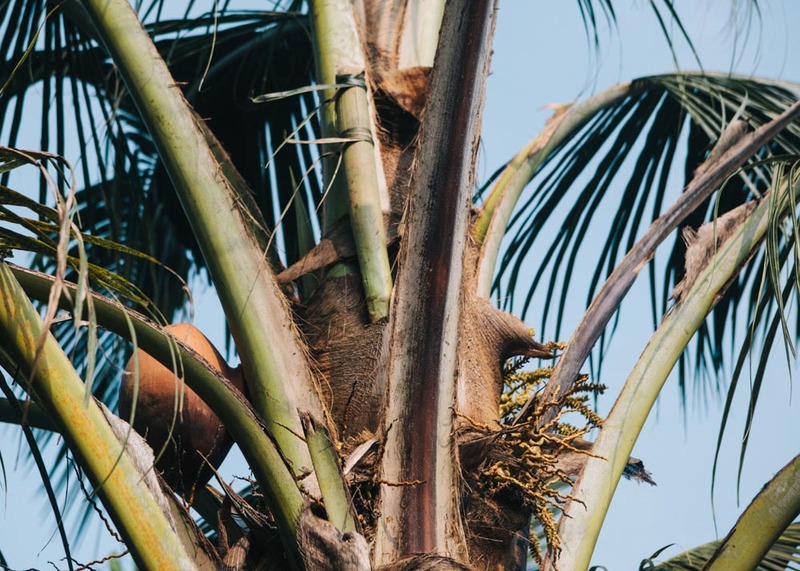 Earlier, Thomas had pointed out a local tradition called toddy tapping, The terracotta pot above is attached to the tree above to collect sap from the palms. It is one man’s job to bash the palms with a bull’s bone for around 20 minutes every day. This encouraged the sap to leak. Once enough has been collected it’s stored in bottles and brewed into toddy, the local liquor of choice. We were intrigues and Thomas agreed to take us and some of the other guests to one of the toddy parlous that night. I can’t say I liked the potent drink but it was a fun privilege to take part in the tradition. And here is Thomas’s family themselves. We loved every minute of our time with them and I hope you’ll get the chance to visit them too. You can book a trip to Greenpalms Homestay through the family’s website, or you can email them directly at community.greenpalms@gmail.com or info@greenpalmhomes.com. Alternatively, call Greenpalms on one of these three numbers: +91 477 2724497 / +91 9497231719 (mobile) /+91 9496956665 (mobile). 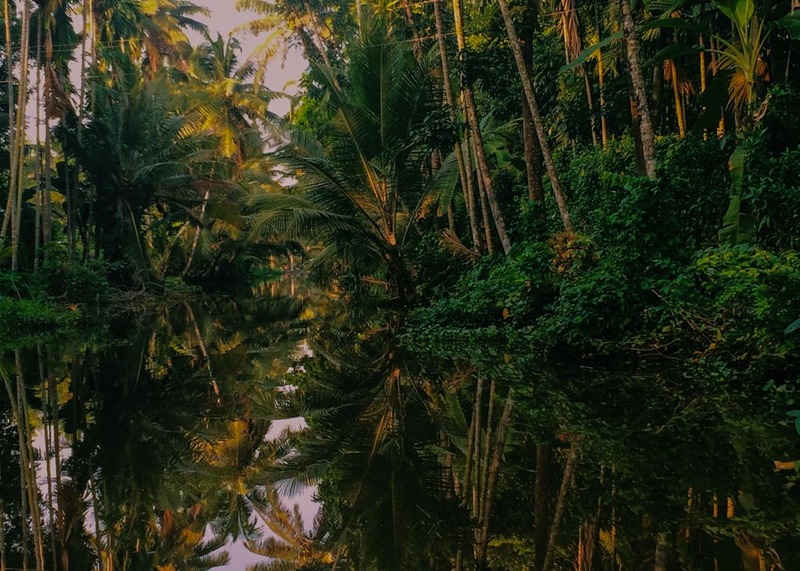 Find more inspiration and tips for planning a trip to Kerala in our detailed Kerala itinerary post. Hello, how very lovely. 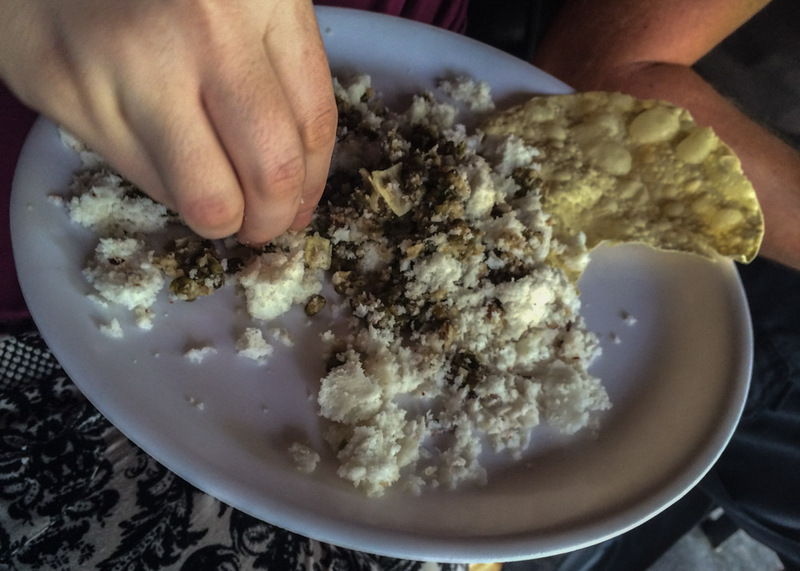 I see Kerala everywhere this week (there is this #keralablogexpress thing going on/Instagram and twitter). I love your pic of the mirrored palm trees. Isn’t it amazing, how some places manage to keep that feel of being a secret/special (despite the fact that Lonely Planet has written about it) . It IS amazing and sometimes those are the best places of all. It’s no mean feat to retain an air of secrecy when featured in the Lonely Planet! Really cool photos! Love the food photos the most. 😉 Greenpalms will be on my mind whenever I plan my Kerala trip. I’m glad that you enjoyed your India journey. Thanks for sharing! What a special experience. When I go back to India that is an area I certainly hope to explore. The places you like to stay at are exactly the kind I also love. 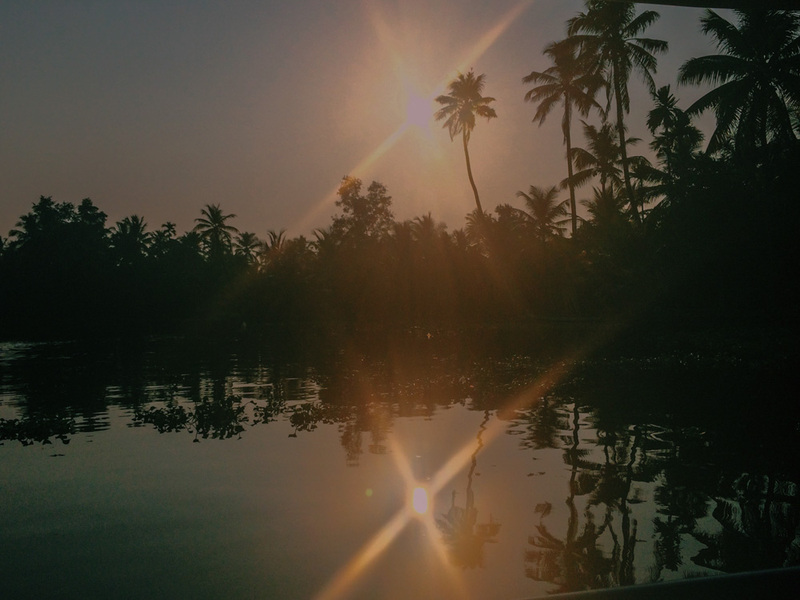 Kerala seems to be calling my name at the moment, more and more every day. I would absolutely love to experience staying at one of these. Thanks for the tip! Next time you visit Finland we should share more of our stories :). 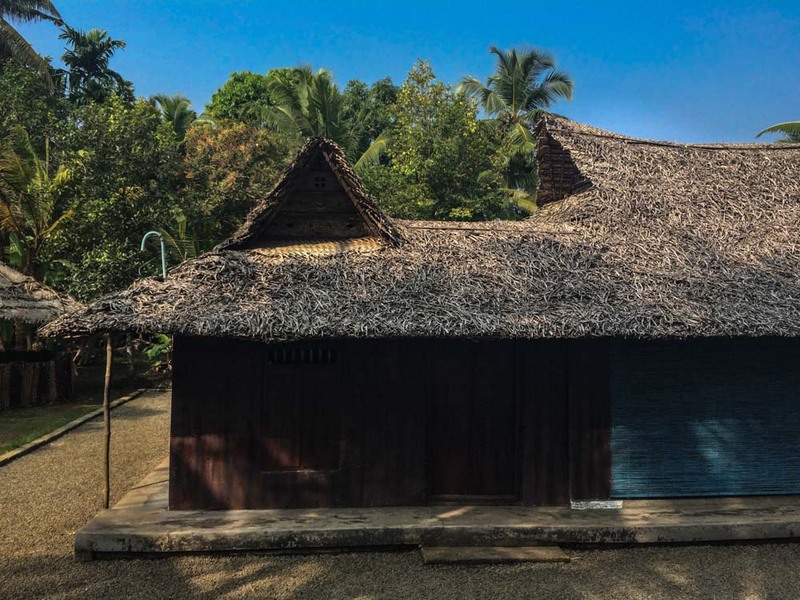 This homestay is located on a special island, with no motorized vehicles, which is quite a treat after traveling around in India for a month! We met and made friend with travelers from all over the world AND had a romantic getaway. This place was everything I could have asked for. Oh and major plus the food is fantastic! The only thing I wish I had known before hand is that it is cash only, so make sure to stop at the ATM before arriving and get a little extra for the activities. Maria, Thomas, Matthew, and Anna we cannot thank you enough for such a wonderful stay and we look forward to returning! How much was the homestay of you don’t mind me asking? It was about $90 USD a night and make sure you bring some extra cash to participate in some of their activities! Totally worth is and not very expensive. One of the important things to know about the homestay is it is cash only and I definitely would prebook as it can get busy if they have a group there. Also, make sure you have a local cell sim you can use because it is a little tricky to find. Maria will give you great directions though. Have fun in paradise!!! 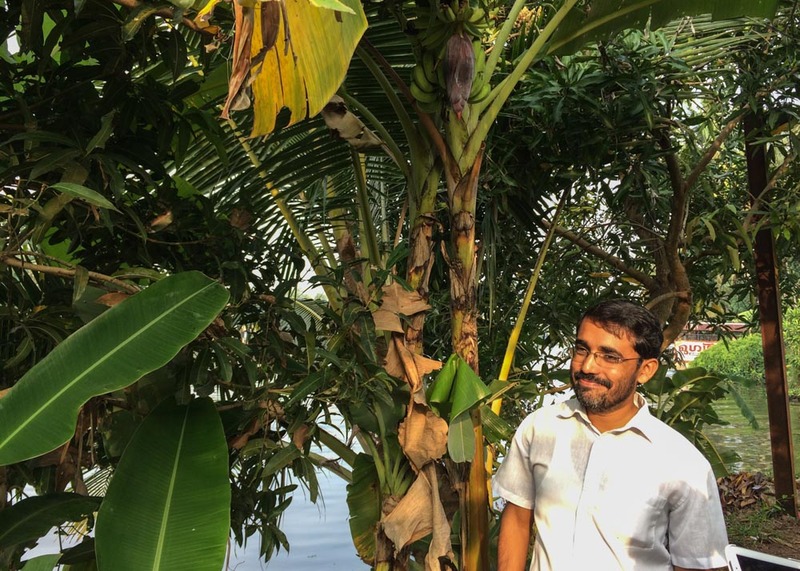 Hi Victoria, thank you for your blog post- I have just booked a trip to Kerala and will be doing your itinerary basically! Just a question, do you pay for the homestay on arrival and how much was it approx?